Studies on the Devonian of China have lasted for about 170 years, and important progress has been made recently. 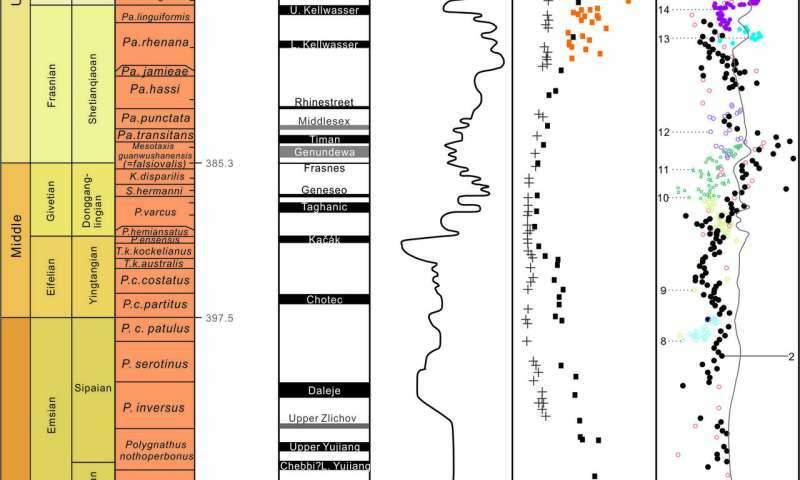 Based on well-studied bio- and chronostratigraphy of the Devonian in South China and adjacent areas, in combination with recent achievements in carbon isotope stratigraphy, event stratigraphy and radioactive isotope ages, researchers from Nanjing briefly summarize the research history and current status of Devonian chronostratigraphy of China, and for the first time introduce a Devonian integrative stratigraphy framework of China. The Devonian (419.2-358.9 Ma) is the first geological period of the late Paleozoic, spanning about 60.3 Ma from the end of the Silurian, and its beginning is marked by the First Appearance Datum (FAD) of graptolite Uncinatograptus uniformis. During this time interval, the Earth's climate system underwent severe perturbations, characterized by drastic dropdown of atmospheric CO2 concentration, and gradual transition from the Silurian greenhouse Earth to the Permo-Carboniferous icehouse Earth. The complex pattern of Devonian climate change was controlled by multiple factors at different time scales, and induced 25 global events that are characterized by sea-level rise and fall, ocean anoxic/hypoxic events, and/or biological extinctions/turnovers. Determination of high-resolution Devonian integrative stratigraphy and timescale framework is essential for studies on the complex ocean-land-atmosphere interactions during the Devonian at different temporal and spatial scales. A review paper by Qie et al. (2018) was published recently in Science China: Earth Sciences. Based on well-studied bio- and chronostratigraphy of Devonian in South China and adjacent areas, in combination with recent achievements in carbon isotope stratigraphy, event stratigraphy and radioactive isotope ages, this paper summarizes the research history and current status of Devonian chronostratigraphy of China, and for the first time introduces Devonian integrative stratigraphy framework of China. In 1985, the global Devonian chronostratigraphy scale was formally defined and subdivided into three series, the lower, middle and upper, and contains seven global stages. Until 1996, all seven Devonian stages' GSSPs have been formally defined and ratified. Conodont is a key taxon in the Devonian biostratigraphic research. Six out of the seven global stages of the Devonian, except for the basal Devonian boundary, are marked by the FAD of certain conodont species. By summarizing the taxonomy and biostratigraphy of conodonts in China, Wang (2018) confirmed 58 Devonian conodonts zones in pelagic facies, among which the biozones of Emsian to Famennian can be precisely correlated to the standard international conodont zones. The bases of the Emsian and the Devonian-Carboniferous boundary (DCB) has been defined by the FAD of conodont Polygnathus kitabicus and Siphonodella sulcata. However, the acceptance of the GSSPs for the bases of the Emsian and DCB have received major criticism since the very beginning of their ratification, and in 2008, the Subcommission on Devonian Stratigraphy (SDS) and Subcommisson on Carboniferous Stratigraphy (SCCS) have decided to redefine the boundary criteria and levels, which are still ongoing investigations. 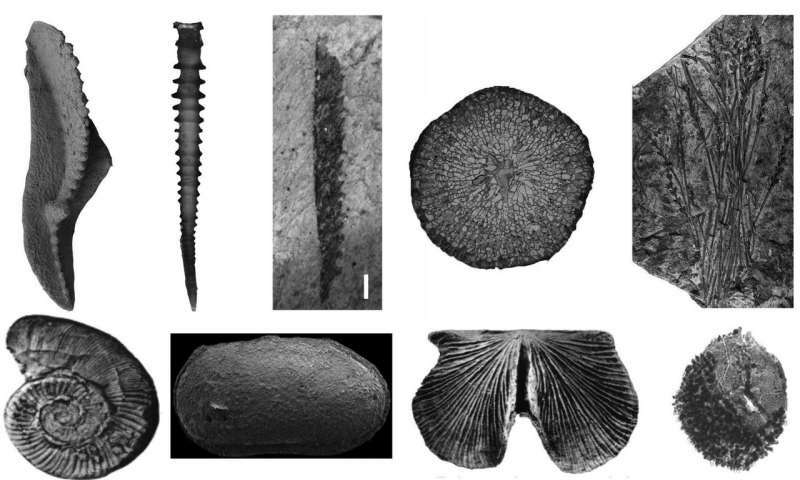 In addition to conodont biostratigraphy, important progresses on biostratigraphic research of graptolite, ostracods, brachiopods, rugose corals, as well as spores and plants are emphatically introduced in this paper. As for chemostratigraphy, carbon and strontium isotopic records from South China show a similar trend with Euramerica sections, and have global correlation significances. δ13C values show major positive shifts in the Silurian-Devonian boundary, Kačák, Frasne, lower and upper Kellwasser, as well as Hangenberg events, suggesting global carbon cycle perturbation during these critical time intervals. In Longmenshan region, 87Sr/86Sr values are 0.70788-0.70868, and its long-term trend agrees with a published mean LOWESS fitted line. After a gradual decline from early Devonian, 87Sr/86Sr ratios reach nadir values and stay stable in middle Devonian, then start to increase in Frasnian and define a plateau throughout the Famennian. 87Sr/86Sr ratios can be used as a tool for precise stratigraphic correlation and dating. This paper also gives a detail introduction to Devonian event stratigraphy, cyclostratigraphy, geological chronology, and stratigraphic correlation among main major palaeobiogeography realms in China. At present, the main tasks for researchers of the Devonian of China include: (1) establishment of continuous astronomical time scale and high-resolution radioactive isotope dating; (2) further subdivision of Chinese regional chronostratigraphy; (3) sulfur and oxygen isotopic stratigraphy of Devonian; (4) integrated stratigraphy studies on the Devonian System in other stratigraphic regions except South China region.